Darold Hamlin is a founding partner of the Emerging Technology Consortium (ETC) which is a group of companies and individuals dedicated to ensuring the benefits of technology reach all communities. He is also a former part owner and Senior Executive for Logistics Systems Incorporated (LSI), a Federal consulting firm located in the Washington, DC metropolitan area. 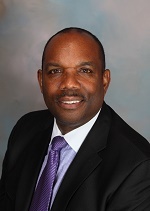 Prior to starting these entrepreneurial ventures, he served as a Chief Information Officer (CIO) for both the City of Philadelphia and the Metropolitan Area Rapid Transit Authority (MARTA) in Atlanta, GA. He is a retired military officer who served as a CIO for the United States Army Reserves and Departmental Chair at Fordham University in New York City. Mr. Hamlin started the ETC because he recognized that technology is the equalizer. He understands that Science Technology Engineering and Math (STEM) is the foundation for next generation industries, but ownership of that technology is the empowering factor. Ownership closes the wealth gap. As America now looks like the rest of the world demographically, there is no more important mission than to ensure that all communities are economically represented. The ETC introduced the District of Columbia’s Emerging Technology Opportunity Act of 2007. The legislation followed the New Economy Transformation Act of 2000 (NET 2000) that moves more technology companies into the city. As part of the implementation of the Emerging Technology Opportunity Act of 2008, the DC Economic Partnership charged the ETC to conduct a technology incubator study which identified the technology assets in the District and determine the requirements to capitalize on the research conducted in and for the technology assets in the City. The ETC completed the study in January 2009. Since then, the ETC has been working on the Districts’ Comprehensive Economic Development Strategy with a focus on innovative inclusion to include both the St. Elizabeth’s Innovative Campus and McMillian Reservoir development project. Currently, Mr. Hamlin is working with National Institutes of Health (NIH) on the “Path to Sustainability Initiative.” The projects’ goal is to increase the number of minorities owning next generation industries. This will be accomplished by teaming Minority Serving Institutions (MSIs) up with successful contracting firm to expand into these new innovative business areas. The pilot does this by creating public private partnerships (MSI with successful Federal Contractors) to pursue and win contracts, grants and cooperative agreements as part of structured process to own Intellectual Property (IP) and then commercialize the IP as part of taking a new product or service to the global market. The Initiative’s goal is two–fold: increase the business areas that woman and minority firms pursue and diversify the revenue streams for MSIs.